March 30th heralds the release of the film, Dragon Ball Z: Battle of Gods in Japan, so to mark the occasion, themed cans of soft drinks will be making a return to Japanese vending machines. The drinks, Dragon Ball Cola Zero and Cider, will contain six different designs when they load up in vending machines on February 25. The cans of Dragon Ball Cola Zero will pay their respects to the Saiyan Saga while the Cider will have images from the Frieza storyline. And both drinks will contain a bevy of ‘vitamins’ to see you through the day. The last time DBZ cans hit the streets was March 2012 when DyDo DrinkCo did this for the “Heroes Hall Can Reprint” series. 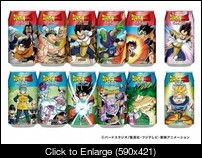 Those cans featured Son Gohan, Vegeta, Son Goku, Piccolo, Frieza, King Kai, Trunks, Cell, Super and Saiyan Goku. The drinks were marketed as containing ”the heavenly power of seven” vitamins. These were vitamin B1, vitamin B2, vitamin B6, vitamin B12, vitamin C, niacin, pantothenic acid.